HTC is pushing a system update to the U12 that includes a number of adjustments for the phone. To start, the update adds two new features: auto zoom when recording video, and 4K video capture at 30fps with no time limit. 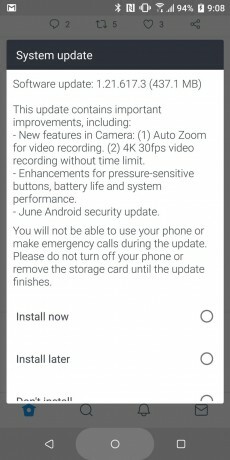 The update includes the June security patch from Google, and makes improvements to battery life and general performance. Most importantly, the update improves the behavior of the touch sensitive side buttons. The U12 uses pressure sensors rather than physical buttons for adjusting the volume and unlocking the phone. The system update makes the buttons more sensitive to touch, which in turn improves their performance. The buttons were a weak spot when the phone first went on sale. With the update installed, the U12's buttons work more naturally. The update is free to download from HTC. HTC's 2018 flagship is the U12+, a large Android slab with a big screen, front and rear dual cameras, see-through glass, and squeezable actions. The phone offers top specs in a modern piece of hardware that's attractive, powerful, and sadly flawed in some respects.